i want to make 3D sound equalizer in maya… is there any easiest way ?? Unless there is a plugin that does this already I think you’d have to write one… that is to analyze the audio and to output amplitude values for specific frequencies. Would it be possible for anyone to update the links to the turtorials in the first post? Many of the first links (under “basic”) appears to be dead to me. I’m new to maya and 3d modeling in general, so I need to find some turtorials and info on where to start and how do things. @galrot if you go to http://lesterbanks.com/ and look through the maya section, you’ll see where he links the maya tutorials from and that’ll give you a good idea of where to get the ones you like. ^^ Thanks for your answer. I will check out the link you provided. I’ve also looked at this so-called Beginner’s Guide to Maya at a digitaltutors.com so I do think I have started to get a understanding of the absolute basic in Maya. However the first step in that tutorial is to create a four wheels/cylindres in two rows next to each other. I don’t really get how I’m supposed to do that … How do I get them do line up perfectly in two rows? Any ideas or any tutorials that explain it to me? Please bear in mind that regardless of reaching the goal or not I will still release 3 Maya Dynamics courses, a RealFlow course as well as an Introduction to Maya for Effects. Each course is a bit over 12 hours of video and it will be in both English and Spanish. If you are completely new, instead of tackling advanced tasks, I would suggest getting a grasp of the foundation even if it takes you away from your immediate desire of car modeling temporarily. With a foundational understanding, you can better understand tutorials for specific objects like cars and be able to troubleshoot. I recommend Lynda.com and as you already know, Digital Tutors. Best to you. I’m Paulo from Philippines, a frustrated graphic artist. I’m a fresh graduate in college and lucky to find job from a private local company. I’m looking for someone who can help me on my frustrating problems. (Maya 2011) my superior gave me 2 weeks to study Maya 2011 but I’m so hard to find forums or any website that can help me on my specific problems. I already downloaded some Maya tuts in youtube but some of its, did not help me a lot. Can anyone could be my mentor in Maya 2011? So I can easily be familiarize with this software. I am 37 year old guy, always wanted to learn 3D since last 15 years but I didn’t get the chance and obviously no resources to learn. I tried once in 2002 to learn 3D studio max but due to personal reasons was unable to complete. Now I have chance and time to learn and I think I can do pretty well. Any help and suggestions will be highly appreciated. Right now I am thinking about subscription of Digital tutor. There are also several people, including Autodesk, that have extensive Maya tutorials on YouTube. Thanks for advice!! I have subscribed to Digital tutor and already learning Maya 2013. We all seen a welding machine in mechanical workshops. We are going to create the same machine in Autodesk Maya, with the use of particles. In this tutorial we will use distance dimension tool and few very simple lines of expression in Autodesk Maya. Hope you will enjoy the tutorial. 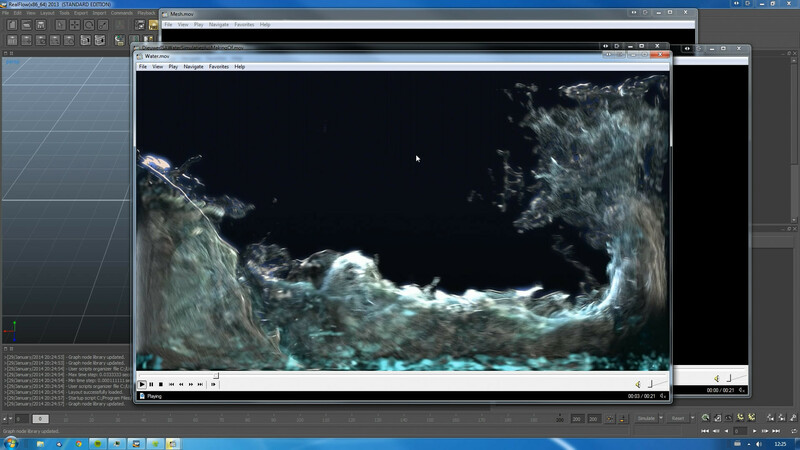 Flooding an Aquarium - Intergrating Realflow mesh and particles using Maya, Krakatoa MY and Nuke. (Original video here: www.vimeo.com/44535646) In part 1 I will show you how to simulate the liquid using Realflow 2013 and Hybrido. In the next two parts we will render this sim and its mesh in Maya using V-Ray and Krakatoa MY. And we’ll color the Krakatoa render by velocity using Magma. And finally in the third part we’ll composite it all in Nuke. Part 2 is the Maya bit! In this series you will learn how to plan out your work, how to model buildings and props using a variety of techniques, how to unwrap models using the uv editor and prepare them for texturing, how to texture your models & props in photoshop which is also explained in a slow and correct procedure. I will be uploading 5 or so of them a day for the next few weeks, i hope they will be of value to some of the new users here. you will find a link to the next part 10 seconds before the end of each video, enjoy.